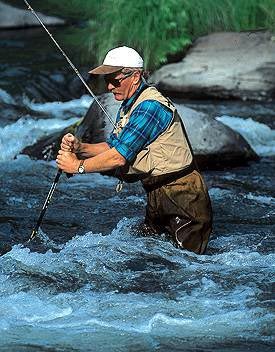 Wading staffs are a necessary piece of equipment for any angler that likes to wade out in a river with loose rocks on the bottom and current variability. After having fallen face first in the Pecos River in northern New Mexico this September, I believe that a staff is an absolutely necessary accessory. A good staff can save you from taking a hard spill on the bottom, and at times it may even save your life. 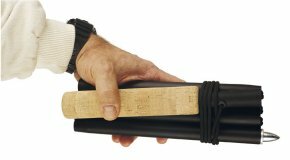 There are some basic things to keep in mind about wading and/or hiking staffs. Look for a strong, solid staff. When you take your staff with you, keep it attached to your fishing vest or waders with a cord. This keeps it handy when you need it, and out of the way when you don't. Get the best, sturdiest staff you can afford. You never know when you will need it. Staffs can not only support you in the river, but they can be used to help dislodge a fly that got snared into an overhanging branch and to feel your way on a river bottom that may not be visible. No matter what you choose, you'll be able to find sticks made of aluminum, wood, or graphite. If you prefer a staff that comes apart to stow neatly in your fishing kit, you can choose from a telescoping staff or a collapsible one. There is also one that works on a fulcrum. One snap of the wrist, and it locks together until you release it. For less than $40, you can get an aluminum collapsible staff that folds into a small cloth pouch that will hook onto your belt. A carbide tip helps prevent slipping on wet, slimy rocks. Some even have a compass embedded in the top of the handle. An attached lanyard makes it easy to hang from your vest. For just under $100, you can get a collapsible stick with a neoprene holster that attaches to a wading belt. The sections are held together with shock cording. These wading staffs may come with a nylon wristband or not, as you choose. You could also take a look at a clicking, telescopic aluminum stick with a special tip for good traction on slippery, underwater rocks. The knob actually unscrews so you can also use the stick as a monopod for your camera. For a little above $100, you can have a truly one of a kind wading staff. Choose one made of your favorite hardwood... Birch, teak, curly maple, black walnut...they are classic, beautiful, and strong. You can choose between a brass climbing tip, or a metal ferrule with a replaceable rubber tip to soften its movements in the water. Made into three sections, they break down to fit into your fishing kit. Each section joins together with high quality brass couplers that are counter sunk into each end. When assembled, the joints are wood on wood, which makes a strong joint. Some fishermen don't care for the collapsible variety of staff. They prefer something solid they know they can rely on. They believe that collapsible staffs can come apart if they become wedged in the rocks or that they can sometimes snap when you need to lean on them heavily. If you are in this group that prefers solid staffs, don't worry. With the materials available today, you can find solid, lightweight staffs that are strong enough to support you. Some of these solid sticks offer a choice of handle, ranging from cork to antler. Some are handcrafted and customized with initials or carvings of fish. Just as they can make the beautiful wooden wading sticks in sections, you can also find your choice of hardwood staff in a solid piece. The grips are wrapped with nylon twine for a grip that doesn't slip, and includes a wrist strap as well as a brass snap so you can secure it to your vest, belt, or shoulder strap. Another unique choice for a solid staff is an aluminum tube made to help keep your balance while wading, but it is hollow, so you can keep your fishing rods inside while hiking to and from your fishing hole. Alternatively, you can also use a mismatched ski pole with the base basket removed. This is an inexpensive alternative for a solid stick. Wading staffs are often vital to life and limb. Just talk with anyone (myself included) who has taken a nasty spill in fast running rocky water.